The cost of the war in Afghanistan for the Polish budget has become an increasingly less bearable burden. Military expenditure is rising dramatically; in the years 2002 – 2006 it amounted to 107 million złoty, but for the year 2009 the number rose to 785 million. The real increase in expenditure as a result of recent “shopping” (among other things: armoured carriers, drone aircraft), according to the estimated forecasts prepared by the Polish Department of Defence, is quite impressive: the figure for 2010 is 1.9 billion złoty. 7 October was the ninth anniversary of the allied mission in Afghanistan. This year is now considered the bloodiest in the nine-year history of this conflict. Since the beginning of the year, 600 coalition soldiers have lost their lives. 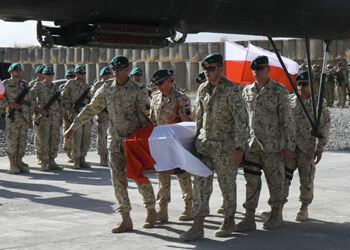 The total number of Polish servicemen who have lost their lives in Afghanistan rose in October to 22. The previous mission in Iraq cost Poland 28 citizens, among them two journalists. Both operations in which the Polish army has actively engaged in have brought military and political deadlock both in Iraq and Afghanistan, no promised contracts for Polish companies, and no solution with the politically awkward problem of American visas for Polish citizens, which is a subject of mounting concern for Polish diplomacy. These disturbing facts combined with news about the excessive and still rising costs paid by the Polish taxpayers have made this war highly unpopular amongst Polish society. According to polls, 73 percent of Polish citizens want the military involvement of their forces to be over as soon as possible. Poland has gained nothing but combat experience for its troops. This is highly surprising. The debate about the advantages of the military missions in Asia seems to be dominated by sheer clichés: loyalty towards allies, honour, etc., and the naive motto “for your freedom and ours”. The necessity to struggle for the Polish interest has been veiled. Amid the most essential issues that could have been settled is the demand to purchase new equipment for the army. Reports from military officials provide a devastating portrait of combat weaponry in the hands of Polish troops that is putting them at high risk. The needs for modern and effective equipment seem to be a matter of urgency. For example, shortage in combat helicopters exposes soldiers to danger as they lack sufficient reconnaissance during their missions. Unfortunately, it is obvious that Poland cannot afford new equipment and the promises of the U.S. government concerning military base support appear to have been taken from thin air. Besides, the announced plans to reorganise the Polish mission and establish a new task focused on the reconstruction of the devastated infrastructure in Afghanistan seems to also be a risky idea, as it needs a lot of economic support. Taking into account the poor economic potential of Poland, it can be rather erratic. In contrast to Polish wishful thinking, the United States’ approach is much more pragmatic and their army experts do not waste time. Scientists working for the Pentagon have encountered 20 huge areas rich in natural resources on an extraordinary scale. Provisionally examined, the treasure is believed to be worth about one billion U.S. dollars, but the real value can appear to be much higher than that. If extracted, it would cover all the costs of the war with interest, making it a remarkably profitable business. The Polish government is planning to continue the mission over the next four years, despite the fact that Minister of Defence Bogdan Klich as well as U.S. President Obama promised that beginning in 2012, the Polish mission in Afghanistan would be restricted to training. The uncertain political benefits of the decision to extend Polish presence will not compensate for the easily foreseen tactical risks, like keeping significant forces outside the country. The recent abolishment of compulsory enlistment into the armed forces and the plan to build a mobile army would make it unusable for efficient defence in the case of an external invasion. The current situation in Europe is fairly stable, but since the Russian-Georgian war in 2008 the potential for rapid change has grown. The prestige of the U.S. has been severely damaged since the war in Iraq and Afghanistan, and a possible conflict with Iran can only accelerate this process. This can lead to a weakening of American commitments to Poland and make the political situation in Central Europe adverse. A dramatic scenario for the future of Poland is, in this case, conceivable.